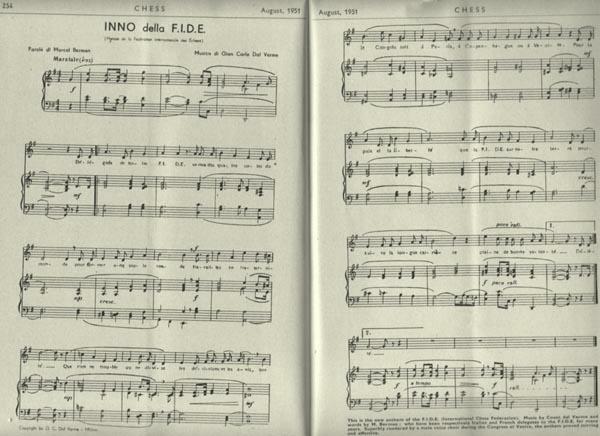 The following non-exhaustive list of items about chess and music in older chess periodicals intentionally leaves aside the innumerable articles on Philidor. ‘Mendelssohn as a Chessplayer’, in the Chess Player’s Chronicle, 22 November 1881, page 565. 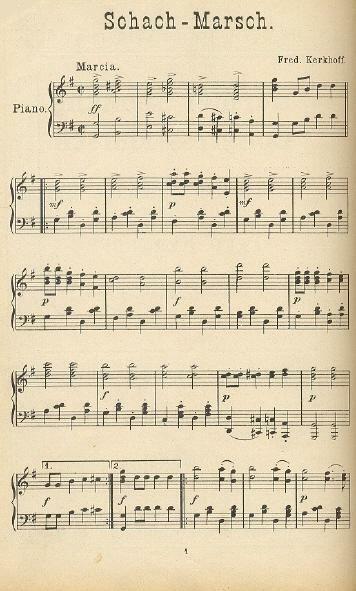 It comprised a brief extract from Letters and Recollections of Mendelssohn by Ferdinand Hiller. Steinitz related an encounter with Richard Wagner on page 213 of the International Chess Magazine, July 1887, page 213. An account of a ‘Musical Chess Tournament’ at King’s Lynn on 30-31 January 1893 was printed in the BCM, March 1893, pages 135-137. 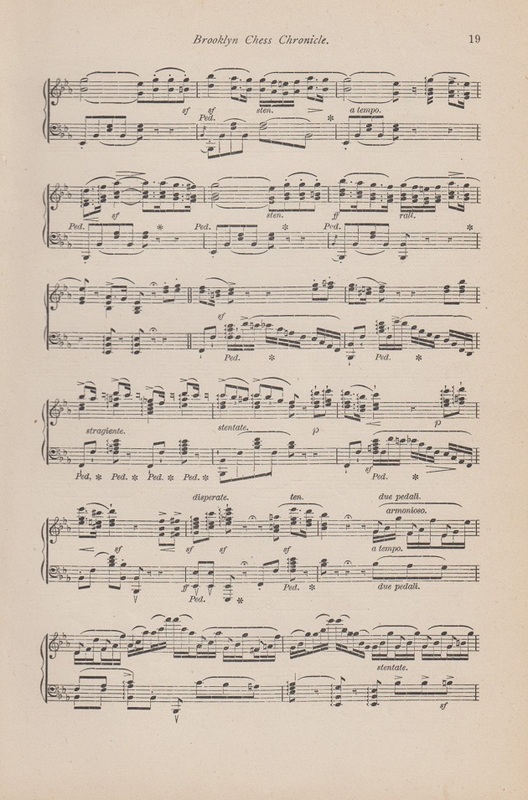 On page 199 of its April 1914 issue the Chess Amateur quoted a short text from the Montreal Gazette about ‘the mysterious connection between music and chess’. ‘Chess and Music. P.P. Sabouroff, who was once president of the Pan-Russian Chess Federation, and also of the Petrograd Chess Club, has composed a Love Symphony for big orchestra, which was played for the first time on 6 May in the “Concert Classique” at Monte Carlo and proved a great success. An article by H.E. 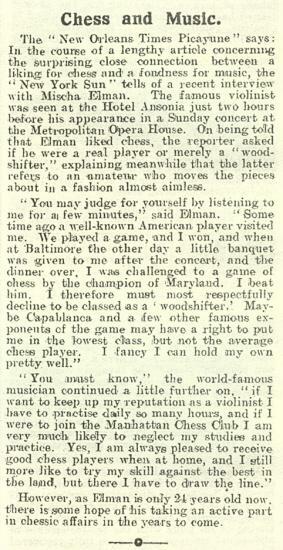 Barry, ‘Again the Musical-Chessist’, appeared on page 126 of the July-August 1925 American Chess Bulletin. 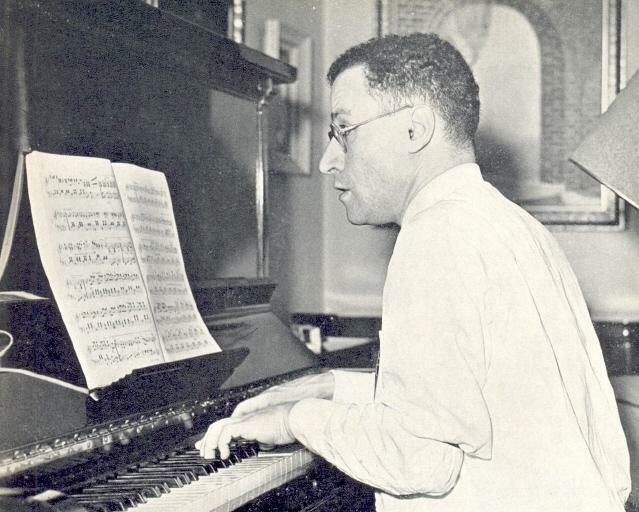 It referred to the ‘striking, harmonious bond between music and chess’ and focussed on Professor Theodore W. Kerkam. 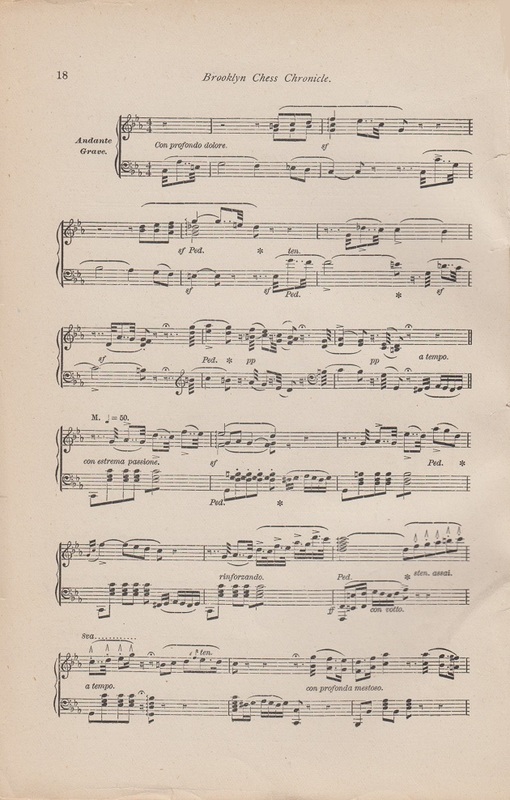 A two-part article ‘La Musique et le Jeu d’Echecs’ by Pierre Maillard was published in Les Cahiers de l’Echiquier Français (May-June, 1935, pages 65-69, and July-August 1935, pages 97-100). 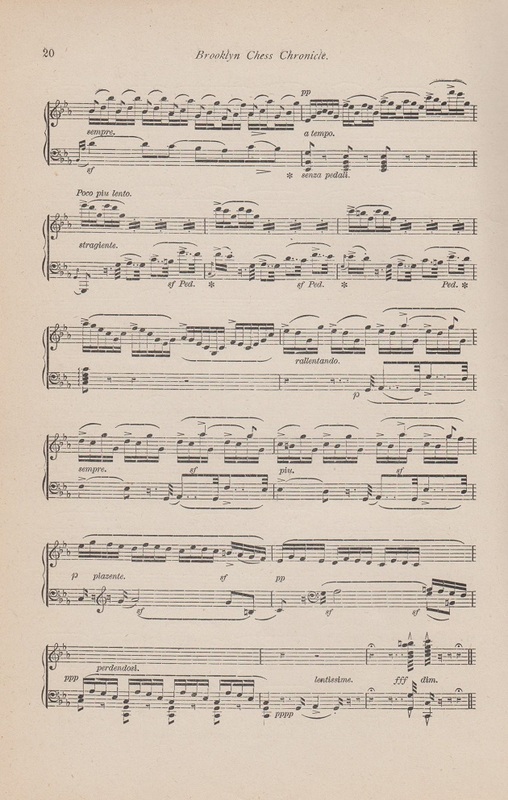 It adopted a broadly theoretical approach, making the point that ‘un morceau de musique est une construction – abstraite en sa totalité immédiate – qui ne prend existence que parce qu’elle s’inscrit dans le temps’, i.e. like chess but unlike the plastic arts, which were labelled ‘des manifestations artistiques d’un caractère essentiellement spatial’. 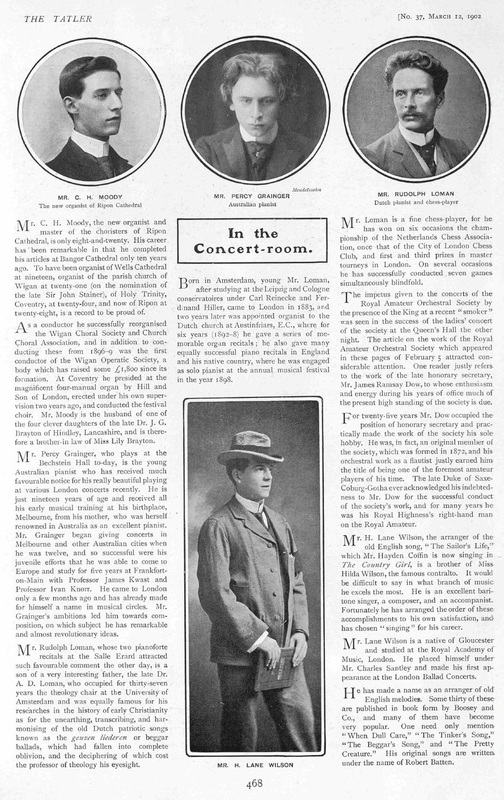 An article entitled ‘Chess and a Great Musician’ on pages 117-118 of the April 1947 BCM quoted from pages 215-216 and 320 of Berta Geissmar’s book The Baton and the Jackboot some chess-related reminiscences about Sir Thomas Beecham. ‘From The Road to Music by Nicolas Slonimsky (Dodd, Mead and Company) we find a curious bit of chessiana. 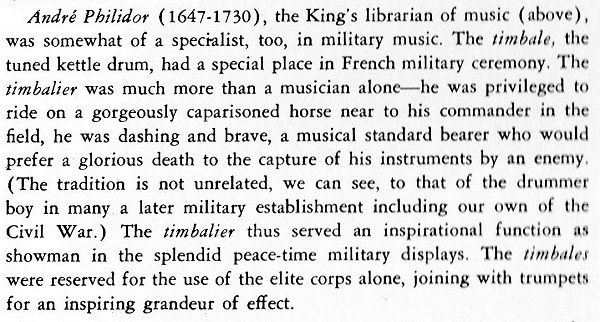 ‘A Genius of Chess and Music’ by M.D. 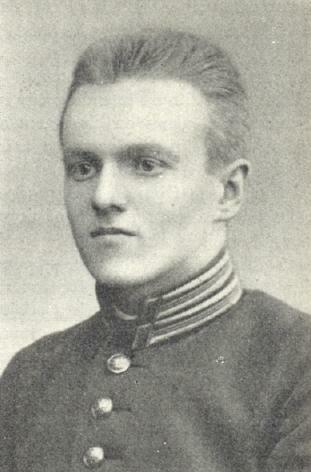 Broun on pages 57-59 of Chess World, April 1953 discussed Mark Taimanov. ‘Musicians and Chess’ on page 97 of Chess World, May 1958. 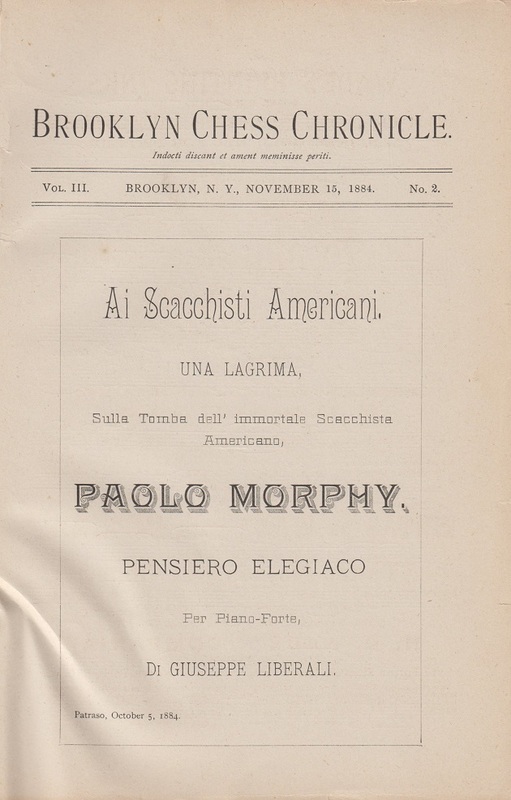 The article began by commenting, ‘Nearly every one of the world’s leading violinists has been a chessplayer, and indeed, a majority of violinists of any note at all’. It called the preponderance of chessplaying violinists an ‘unsolved question’. ‘Chess and Music’ by Louis Persinger on pages 209-210 of Chess Life, July 1961. 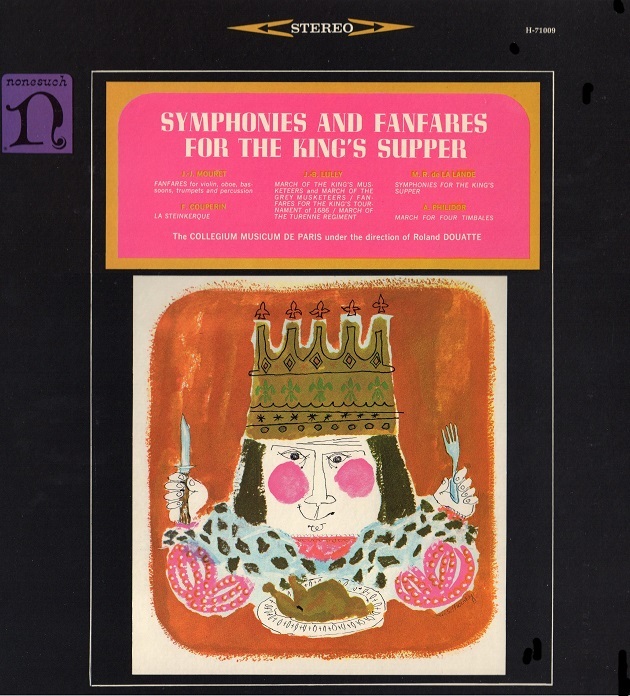 A discussion of the affinity between the two arts (‘I do believe that musicians have had a very special hypnotic fascination for the 32 little figures and have always been very willing slaves to those little characters’ inexhaustible intrigues and pranks.’). Persinger included a long list of chess-loving musicians. Regarding Mischa Elman, Moriz Rosenthal and other musicians, see pages 222-224 of Chess Secrets I Learned from the Masters by Edward Lasker (New York, 1951). Rosenthal was discussed too in C.N.s 6171 and 6184. An article ‘Chess and Music’ by D.G. McIntyre was published in the March 1958 South African Chessplayer and reproduced on pages 154-155 of the October 1984 issue. Wijnand Engelkes (Zeist, the Netherlands) points out the score and text of a march written in honour of Max Euwe. 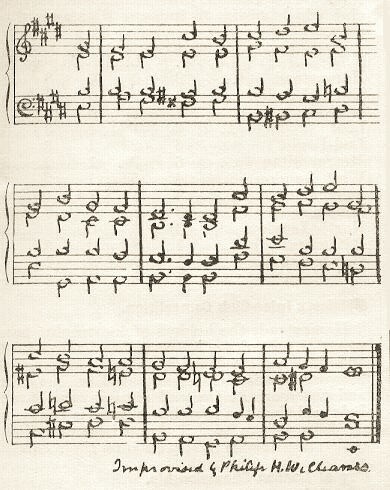 For information about la dynastie des Philidor two particularly detailed books are François André Danican Philidor. La culture échiquéenne en France et en Angleterre au XVIIIe siècle by Sergio Boffa (Olomouc, 2010) and Les Philidor by Nicolas Dupont-Danican Philidor (Bourg-la-Reine, 1997). Information is sought by Avital Pilpel (Haifa, Israel) about a musical entitled Șah Mat (‘Checkmate’). It was an Israeli production in Romanian, and an advertisement in the National Library of Israel’s collection of posters and other ephemera states that the opening night was on 30 September 1967 at the Ohel Shem Theatre in Tel Aviv. 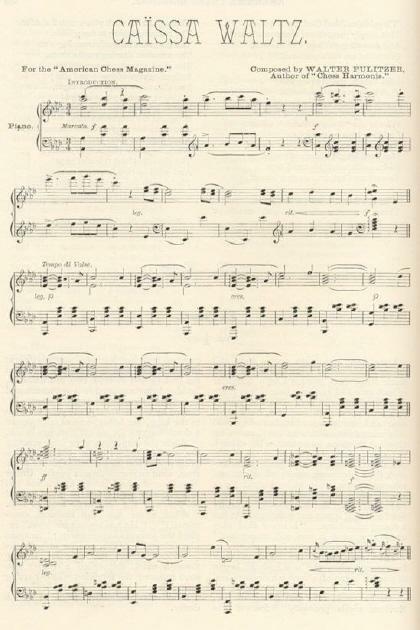 There are further references to music in the Factfinder. See too our feature article Sergei Prokofiev and Chess.